Four minutes and 16 seconds on NPR’s premier daily news program, “All Things Considered,” is a major story. The longest one on Thursday, July 28’s program, about the difficulties facing the spouses of US military personnel, clocked in at 4:59. Maybe, if this collective Jewish presence can only survive by the sword, then Israel really ain’t a good idea. Did I mention that these gentlemen are in the US on a tour sponsored by the same phony ‘pro-Israel’ lobby, J Street? 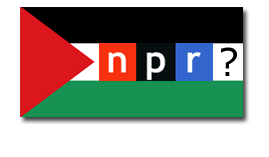 NPR did, but its piece didn’t talk about J Street’s funding from anti-Israel sources, or its history of lobbying against sanctions on Iran, for the Goldstone report, and for the condemnation of Israel in the UN Security Council. The U.S. hasn’t helped matters, says Daniel Levy of the New American Foundation. He says that the Obama administration tried, but failed, to get its partners — the U.N., European Union and Russia — to sign onto a statement encouraging the Palestinians to drop the U.N. bid. The text, Levy says, looked like it was drafted in Jerusalem. “That’s where we got stuck. I think that isn’t helping get past this U.N. bump. It’s probably going to make a U.N. vote more likely and … this kind of approach, it’s really beginning to marginalize and almost make irrelevant U.S. diplomacy on such an important issue,” he says. One of the reasons the Quartet was unable to issue a statement was because [Russian Foreign Minister Sergei] Lavrov reportedly objected to a formula whereby the Quartet would have endorsed renewing Israeli-Palestinian negotiations based on a return to the 1967 lines, with agreed upon swaps, and Palestinian recognition of Israel as a Jewish state. Lavrov – reflecting Russia’s desire to play to the Arab League – wasn’t enamored of the Jewish state part of the equation. And it wasn’t only Lavrov. According to Israeli officials, the EU’s Ashton came to the meeting hoping to get the Quartet to call for a renewal of talks based on US President Barack Obama’s parameters of the 1967 lines, with mutually agreed swaps, but without other language Obama used during his two Middle East speeches in May: language much more amenable to Israel that affirmed the country as a Jewish state and called for ironclad security arrangements before any future Israeli withdrawal. In other words, the Russians, who represented Arab interests in the negotiations, wanted an agreement calling for Israel to withdraw to (more or less) pre-1967 lines without getting anything in return — not even recognition of what will be left of Israel as a Jewish state! The recognition issue is key, and the Palestinian Arabs have consistently refused to agree to it. Even the language of the Obama plan, which represented a sharp shift in US policy toward the Arabs, was not enough for them. The NPR piece didn’t mention recognition of the Jewish state, didn’t mention the Palestinian Authority’s refusal to negotiate anything other than acceptance of all of its demands, and — this goes without saying — didn’t discuss doubts about the ultimate intentions of the Arab side. It was 4 minutes and 16 seconds of unrelieved propaganda, without even a nod toward balance. Remember this when your local public radio station asks for donations. I will. This entry was posted on Friday, July 29th, 2011 at 9:27 am and is filed under J Street, Media, NPR. You can follow any responses to this entry through the RSS 2.0 feed. Both comments and pings are currently closed. And what does NPR stand for? I would have appreciated your naming the former Israeli General who chose to throw in his lot with JStreet. The participants in J Street’s tour are Maj. Gen. (Ret) Natan Sharoni, Ambassador Ilan Baruch, Consul General Alon Pinkas, Col. (Ret) Shaul Arieli, Brig. Gen. (Ret.) Nehemiah Dagan, Maj. Gen. (Ret) Shlomo Gazit and Attorney Gilead Sher. It was Gazit who was interviewed on the NPR program. During my one visit to Israel thus far (2007), Dagan was one of our guides. Yes, he was quite the liberal sort. Believed that Israel was strong enough to make lots of concessions. Didn’t buy it then, and don’t buy it now.